There's no mention about putting DBNO back in And it's still stupid COG vs COG... of course they can change that, they just don't want to! Never thought I'd say this, especially since I bought the other Gears releases day one, but...I might rent this Gears game at some point to give it a shot, primarily for the single-player. The single player campaign is good, but the multiplayer is poor, it's Gears trying to be COD! I like the single player, the MP is just a mess, I can live with them taking out DBNO but removing the Locust from MP still baffles me, i'm surprised the reviewer didn't even mention it and because she didn't and also because she thinks PCF did the multiplayer (it was Epic dear!) and also how she doesn't have a pop at Epic for removing it's most popular gametype, her review is just downright poor! Haven't played the game personally, but I had some slight worries posting that, specifically because [Patricia Hernandez] has had a checkered record with regards to hitting the high notes on reviews. I was hoping she'd figured her way around by now. Questions and answers from this week's Epic podcast. When is Capitol being released? In fact Capitol has undergone a name change, in which more information will be released for the upcoming overrun map TOMORROW. When is the next DLC being released? Next week we will have more information on the upcoming DLC by EPIC. What is the new Gametype for the upcoming DLC? It will be a single objective based gametype, more information next week. When is the Title Update being released? More information will be released on the TU when EPIC release more information on the Upcoming DLC (So next week). Also will be released with the new DLC. Are there going to be more Characters in future DLC? At this point according to Raczilla, there are no future plans for any DLC characters. Why are DLC achievements locked only to online Multiplayer? According to Jim, this will all be fixed in the next TU. You will be able to gain achievements within Private. At this point it is impossible. Can centre screen firing be removed? Can the Scorcher ammo be reduced? Under discussion, at this current time the Scorcher can easily kill 5 players with one clip. So they are going to have a look at what they can do with that. Can we try the old control layout in the test server? Unfortunately at this point it is impossible, so no. On May 15th, you’ll be able to download the second MAXIM Map, Dreadnought, available for OverRun players free of charge for a limited time. In the months immediately following Emergence Day, the COG managed to capture some Locust Berserkers. Thinking that a ship at sea would be safe from an underground enemy, the COG decided to transport their prize to a secure research facility via the CNV Pomeroy. Little did they know that the Locust had waterborne beasts from the underground rivers of the Hollow, or that the Locust soldiers would use them so relentlessly to rescue the captured Berserkers. The Pomeroy was corralled into a narrow channel and forced ashore, where the Locust sent a mass of troops to assault and overwhelm the beached vessel. The Gears of War: Judgment DLC “Lost Relics” is coming in June! The pack will include four new maps, a new single objective gametype, new armor and new weapon skins. BREAKTHROUGH – Breakthrough is a single-objective gametype that features two teams with very distinct roles: one team has possession of a flag that they must deliver to a set location; the opposing team has a purely defensive role and unlimited resources. The attacking team must break through the enemy team’s defensive line and deliver the flag before their pool of lives run out. 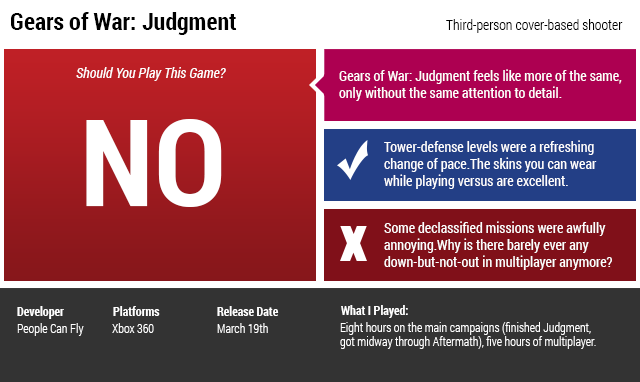 Epic Games has announced the details of Gear of War: Judgment’s title update, as well as a breakdown of some new achievements for the game. The title update will arrive along with Lost Relics, some fresh multiplayer Judgment DLC coming next month. The achievements, meanwhile, add up to 250 new Gamerscore. Fixed an issue that caused debug info to appear on the overhead maps when swapping out weapons. Scorcher magazine size reduced from 34-15 for private and LAN play. While holding the Boom Shield, female character heads are no longer more exposed than male characters. Prize Boxes will now deliver all unlockable content before rewarding XP. All gametypes will now have a rifle and a shotgun as the default loadout except for Free for All and Master at Arms. Fixed an issue with the Dreadnought DLC not appearing in VIP Overrun searches. Fixed an issue with the grenade animation. Reduced volume of self and team footsteps to better highlight enemy approach noises. Fixed the "You Lookin At Me" achievement German translation. The "Surprise" achievement can now be unlocked on dedicated servers. Fixed an issue where pressing the back button for the scoreboard caused the screen to blur until respawn. When searching DLC playlists on Execution and Master at Arms, screen will no longer freeze, forcing you to restart searching. Fixed an issue which caused game crashes while removing a storage device in the pregame lobby of a ranked versus match. All of the Survival map names should now show on the Survival leaderboards. Fixed an exploit where players could earn extra prize boxes. Secret bookshelf passages in the Library map are now locked in Execution and Breakthrough gametypes. Fixed a typo in the current achievement list. Fixed an issue with the Engineer's sentry targeting Locusts being executed. Fixed Master at Arms gametype description. The Digger no longer misfires after swapping from a loaded Sawed-Off. Fixed an issue with Wretches teleporting back to perches. Fixed random crashes while accessing content from a USB drive at the title screen. Fixed an issue with the Generator not showing damage while being attacked. Campaign: Players will no longer be blocked by the missing stairs leading out of the Imulsion room in Aftermath. Gnasher ammo updates (start w/ two clips instead of one) for private and LAN play. Stim-grenades removed from starting loadout across all gametypes except FFA for private and LAN play. Weapon swaps now available per-map per-playlist on dedicated servers. Grenades no longer refill from Ammo Boxes. Minh’s hitbox adjusted for better detection around head. Mortar back on Gondola in place of Torquebow (dedicated server replication issues fixed). Mauler no longer able to hit things through walls.